IF 1980s saw the rise of what is now described as the ‘Stephanian novel,’ 1990s may well be remembered as the decade of the "Elphinstonian poetry." In this slim volume of less than 150 pages, as much as half of the Indian English poetry has flowed out of the creative springs of Elpinstone College, Bombay. And it is hard to accept that it could be just another act of literary fortuitousness. In our times of hardbound poetry editions, such acts of literary or non-literary miracles happen only if they are so willed. The introduction to this anthology is an apology in poor taste. Yet another self-defeating intervention on part of the critic inside the poet, who is forever eager to usurp both the role of the academic critic and the reader’s freedom to experience, judge and/or evaluate. An introduction should, at best, be a friendly overture to the reader, not a way of ‘colonising’ his mind. And least of all, by a self-proclaimed post-colonial poet/editor! Whatever his reasons, it’s difficult to sympathise with Ranjit Hoskote’s irrepressible impulse to ‘teach,’ rather sermonise the reader, which, of course, he does with aplomb, using a good deal of entirely unnecessary academic claptrap. The 1990s have seen as many as five anthologies of Indian English poetry, bearing imprints as well-known as OUP, Rupa and Orient Longman. Does it mean that the Renaissance of Indian English poetry? Hardly. Only if one were to cast a hard look beyond the mere surface gloss of the frontispieces, one would discover that the same names are being rotated with almost ritualistic regularity, of course, with a few, much needed though arbitrary additions or subtractions here or there. Some novelty and newness this is! Perhaps, a decade is too short a period for the newness and novelty to make its presence felt. 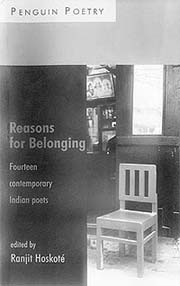 And in certain cases, as the selection in this particular anthology testifies, some poets such as Vijay Nambisan, C.P. Surendran, Jerry Pinto, Smita Agarwal and Arundhati Subramaniam have already been canonised though each is barely ‘one-book old.’ With the exception of Jeet Thayil, Tabish Khair, Ranjit Hoskote and Rukhmini Bhaya Nair, all of whom have two or more than two collections of poems under their belt, others such as Vivek Narayanan, Gavin Barrett, Anjum Hasan and H. Masud Taj are still testing the waters. This inevitably puts a question mark over the criterion for selection, bringing to the fore the inevitable politics of inclusion and/or exclusion. And had it not been for the uneven quality of the poems, one could even afford to leave this politics alone. What really creates a poetic arrhythmia in an otherwise confident and self-assured selection is the insistence of occasional naivete to pass off as audacious wit or the poetic diffidence dressing up as churlishness. In Magritte’s Dreams, H. Masud Taj’s efforts at being argumentative appear strained, even pretentious when he starts off in his characteristic manner, The horsehead is a door/The clock is wind/ The jug is a bird/ The suitcase is a valise. Even his other poems are in no different a mould. Consider Yellow with its adolescent, banal cliches such as Light would not be as yellow/If the shadows were not as black or the nursery rhyme-like incantations of Medina Highway such as Lord of those who stop to fill/Lord of those who take the exit lane. If this is poetry, it certainly couldn’t have been shallower or fluffier! The superficial architectonic quality that informs Taj’s poetry is not so much a tribute to his poetic talent as it’s to his training as an architect. If this is not enough, then do reflect on some of the ‘poetic outpourings’ of Vivek Narayanan, especially in MGR Meets God in Person. Giving up all pretentiousness to poetic language and conventions, he happily surrenders himself to the ineluctable charms of his English prose, reeling off wisecracks like MGR stands with his cap tugged firmly down his bald head. His joined cardboard wings blow gently in the breeze or Somebody, either standing MGR or reclining God, says a word. Possibly two. We cannot be certain. The only thing reader is certain about is that whatever else it might be, it’s not poetry at all. And of course, the reader is not expected to bother with such small things as the line-breaks or the stanzaic patterns, for none of that appears to fall within the range of the poet’s conception of poetry. What someone needs to tell these intrepid young ‘poetasters’ is that ‘prose poetry,’ too, has its own subversive structures of internal rhythm. Where are they, pray? Among the newest of the new, Jerry Pinto and Gavin Barrett only manage to do a shade better. Perhaps Anjum Hasan and Smita Agarwal, both women, are the only ones who show definite promise and so deserve a more serious critical attention, which is hardly a consolation, considering that what is being showcased for us here is the ‘future’ of Indian English poetry. And that appears much less than what it should be, encouraging! The staccato rhythms of C.P. Surendran do nothing to salvage the monotone of his existential solipsism, which would, at best, appear banal or cliched, if not totally out of place in what the editor prefers to describe as the ‘post-modern’ or the ‘post-colonial’ context. However, Vijay Nambisan does seem to possess a definite sweep of imagination that often makes his longer poems more graceful and lyrical, even better structured and more controlled than his short lyrics. In this respect, Diary of the Expedition and The Attic work much better than Reflections on May Day or Madras Central. It was for Madras Central that Vijay had won the All India Poetry Competition in 1988, organised by the British Council and Poetry Society (India). Incidentally, Vijay is not the only one to have laid a claim to this honour, as this could easily be said about most of the other poets included in this anthology as well. If this were, indeed, one of the guiding principles of selection, it would have been much better for the editor to declare so in the title as well as the introduction. Ultimately, it’s the presence of the ‘veterans’ among the new generation such as Jeet Thayil, Tabish Khair, Ranjit Hoskote and Rukhmini Bhaya Nair that proves to be the saving grace of this anthology. They have been around long enough to convince anyone about their seriousness and commitment to poetry. It’s another matter that they, too, discover their real springs of inspiration only when they choose to drop their academic gowns and bare themselves, or tremble on the threshold of a long-forgotten memory or plunge headlong into the momentary truths, desperately holding on to their fragile subjectivity. No matter what prompted Jeet Thayil to pen down At Kabul Zoo, the Lion, its has the power and the suggestiveness to set off reverberations across the interstices of history. If part I of From: The Genesis Godown captures the myriad faces of monsoon in Kerala, its part II offers a sombre, reflective meditation on the "slow erosions of memory." Tabish Khair, too, is very much in perfect control of his poetic faculties when he either rips the layers off personal relationships in his lyrical reminiscences titled To My Father, across the Seven Seas or searches anxiously through both memory and tradition in The Other Half of Kabir’s Doha so as to retrieve his poetic identity. Of a piece with this kind of poetry is Ranjit Hoskote’s A Poem for Grandmother, poignant in its simplicity and disarmingly honest in its tone and expression. And undoubtedly, it is this kind of soul-searching poetry, free from the encumbrances of academic pretentiousness, though not from the burden of memory and history, that reader often seeks from an Indian English poet, too. All that one expects from him is that he would return more frequently to Kabir’s dohas or Ghalib’s ghazals to revitalise the jejune literary forms than he actually does in this anthology. Trouble begins only when ‘our’ poet refuses either to recognise his own literary traditions or to discard his academic gown. That’s when the poetry begins to slip through his fingers, plunging his verbal artifices into both obscurity and obscurantism. And it’s against the militancy of this obscurantism and the overzealous fanaticism of this academisation that the Indian English poetry must protect itself if it has to survive where it ultimately should, within the hearts of the people.